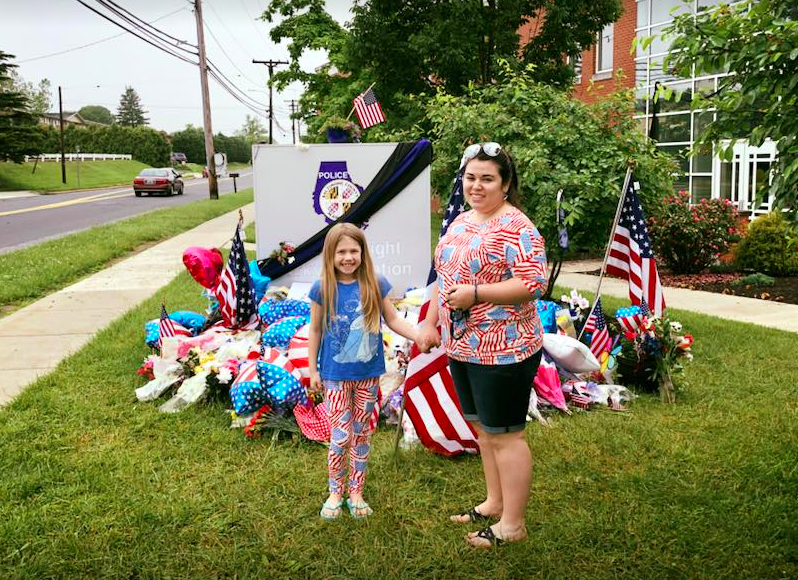 A month ago, Laura Joy Rode and Erinn Patrick, third-grade teachers at Seven Oaks Elementary and residents of Parkville, sat in their classrooms with their students until 9 p.m. as police wrapped up their initial investigation of the death of one of their own, Officer Amy Caprio. 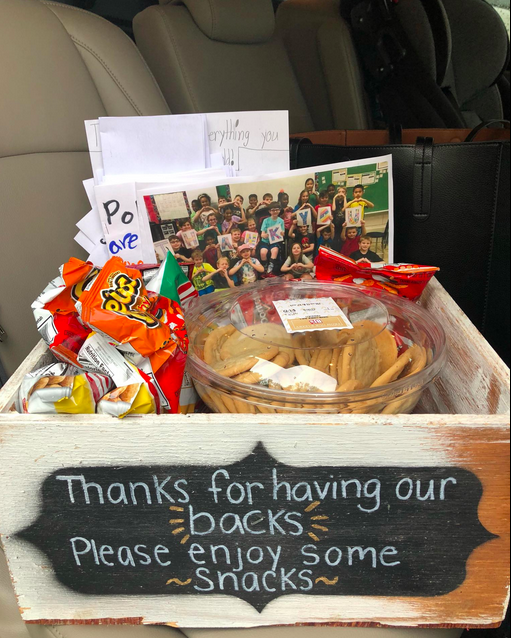 In those dark hours, however, their students were thinking less about the fear of a lockdown and more about what they could do for the police officers in their precinct who were mourning the loss of their partner. 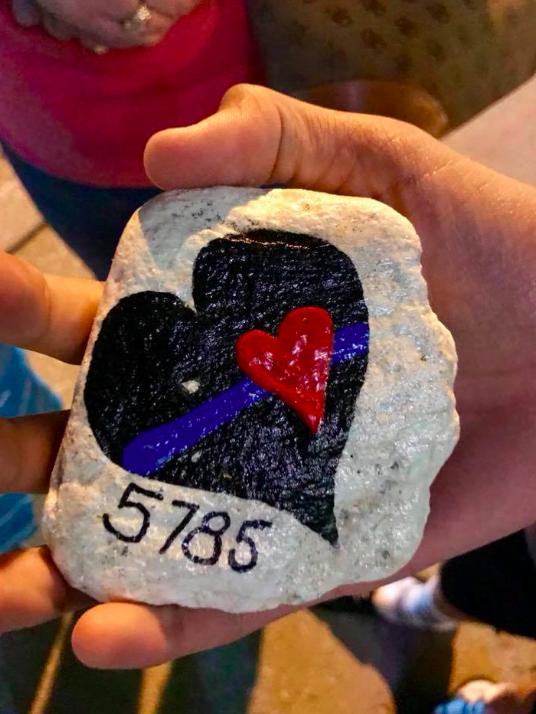 The desire to give back, to support the Parkville and surrounding precincts, has only strengthened since May 21 when Officer Caprio was killed in the line of duty. 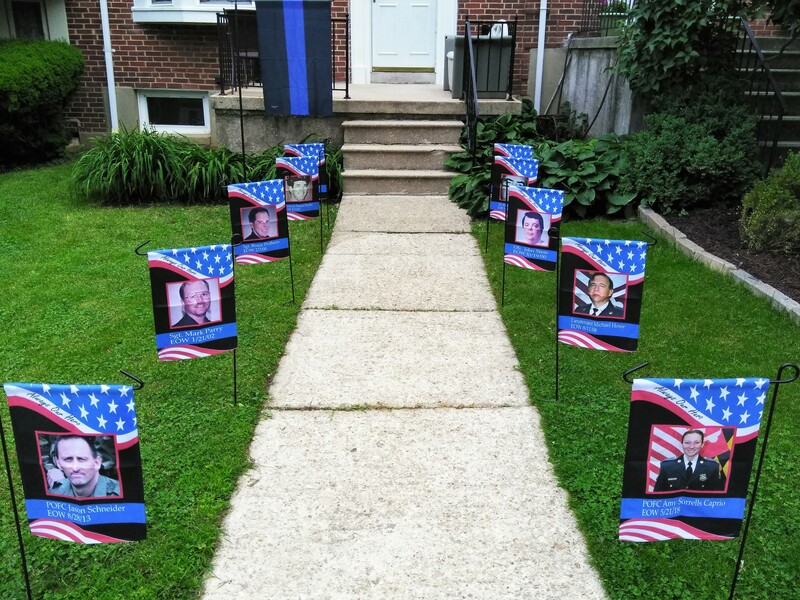 Rob Williams, a resident of Rodgers Forge and Citizens on Patrol leader and volunteer for the last ten years, decided to create a memorial display in his front yard on Regester Avenue, honoring all ten Baltimore County officers who have died in the line of duty. Williams contacted a company called Flagology that had the specific hero flag template he was looking for. He gathered the photos of the other officers and completed the display on June 10. Such memorials are on display in other neighborhood communities, including Carney and Loch Raven Village. Other residents around the area have used their creativity to raise money for various funds. Maria Greenwood has formed a group that makes police survival kits, which are delivered to police stations all over the state of Maryland. According to Lisa Westervelt, one of the members of the group, Greenwood has been awarded for her community-building efforts and recognizing officers for their hard work. 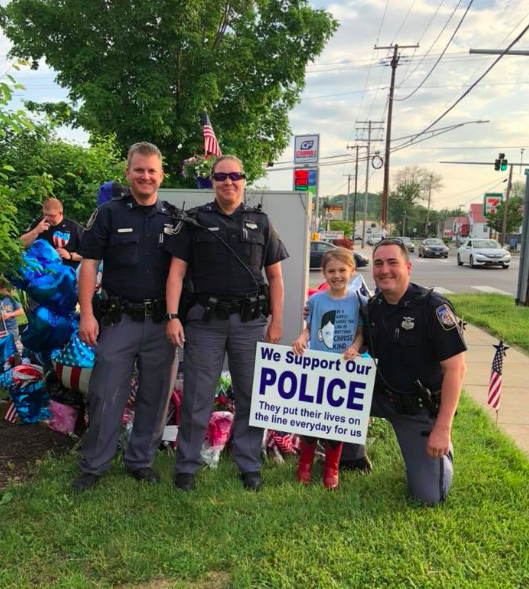 “When Parkville experienced its tragedy, Maria ran around getting donations needed for the kids and delivered a ton of them to the station in support of the officers who had lost their sister in blue,” said Westervelt. 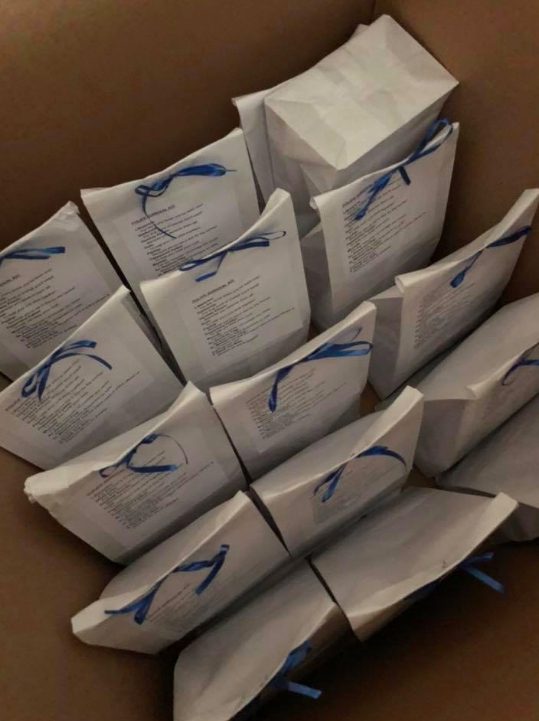 According to Greenwood, they delivered 200 police survival kits after the death of Officer Caprio. 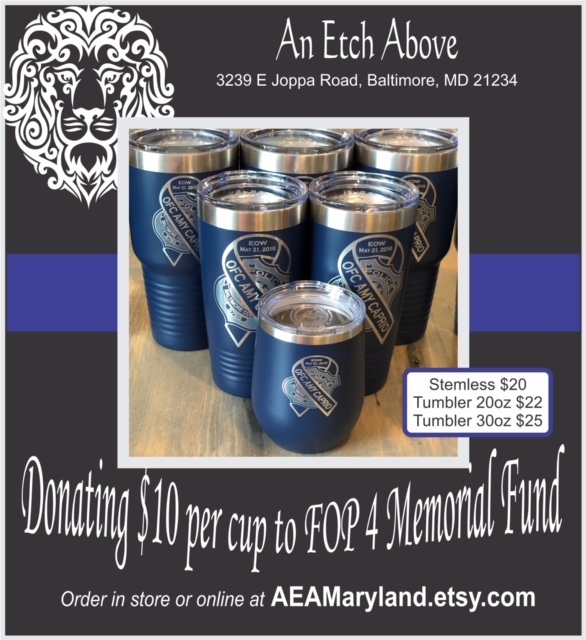 Kim Lyons, founder and owner of An Etch Above, created Memorial Cups in Officer Caprio’s honor. For each cup sold with the memorial design, Lyons is donating $10 to the FOP 4 Memorial Fund. According to Lyon’s website, they have raised over $750 in Caprio’s memory. Others from around the state have created fundraisers built around their hobbies and organizations. One such effort to raise money was done by the Chesapeake Jeep Club, among others, who hosted a ride to honor Caprio. The ride, which took place May 26, was organized by Prince George’s County K9 Officer Mike Cicale. Although Ellicott City resident and Jeep owner, Sunny Yoo, could not participate in the event, he is mindful of the work that Cicale and others do to honor fallen heroes. The tributes and memorials will continue throughout the summer. Both Towson and Cockeysville organizers of their respective Citizens On Patrol (COP) programs will be honoring Officer Caprio on August 7, which is National Night Out and recognizes those who serve their communities to keep them safer. 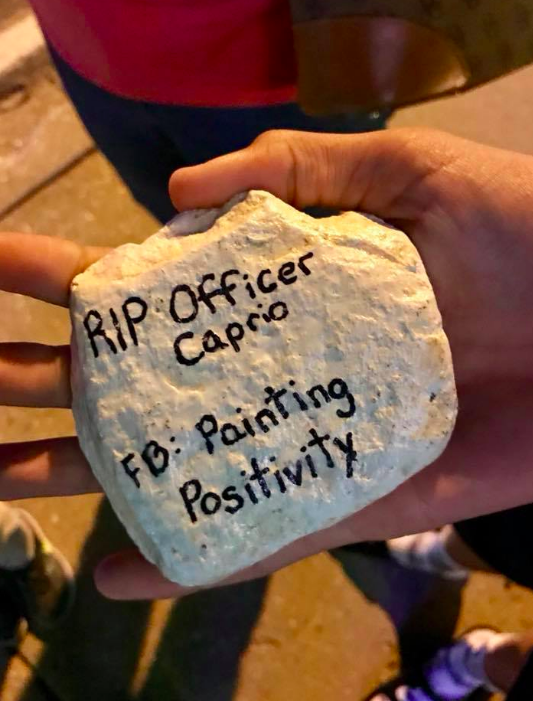 According to Pat France, Vice President of the Towson-Area Citizens on Patrol (TACOP), they will hold a moment of silence for Officer Caprio at their event on Washington Ave. at 6:20 p.m. 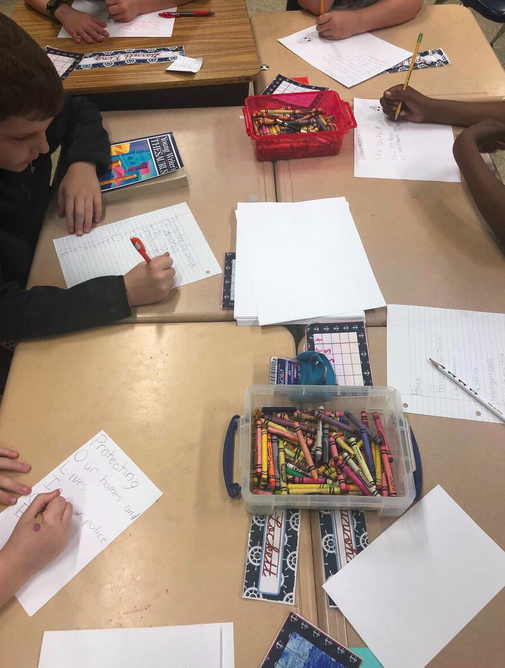 Even with school being out, Seven Oaks Elementary teacher Laura Joy Rode is still touched by the actions of her third-grade students.